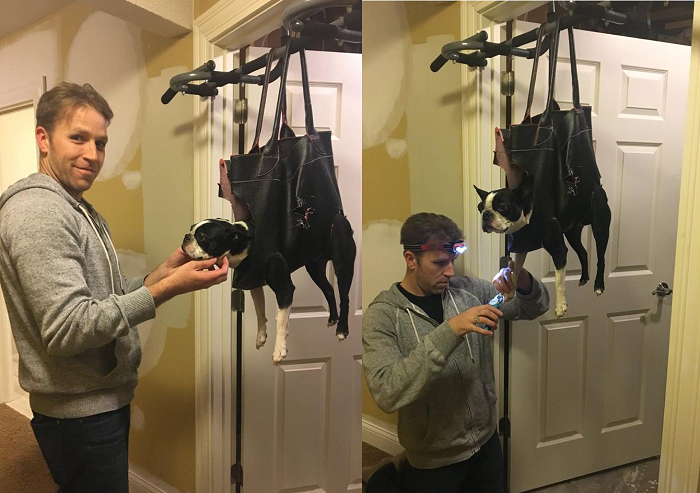 Oliver, the spirited Boston Terrier, loved a lot of things in life, but getting his nails clipped was definitely not one of them. He loved walks. He loved treats. He loved getting ear scratches and belly rubs. But he absolutely loathed having his nails trimmed. Any time Oliver’s family attempted to groom their beloved pooch at home, he would do everything in his power to escape them. Finally, dad came up with a solution that sounded crazy. Actually, it looked just as crazy as it sounded…but it worked! He went to his local Goodwill and purchased a bag that had seen better days. No one would miss it, and so he brought it home and got to work. He cut Oliver-shaped holes for his legs and neck. Incredibly, as soon as Oliver was lifted into the air, he stopped squirming. Dangling several feet above the ground, he was uncharacteristically calm! Oliver’s grooming session was over in no time at all, and while he might have been confused in the meantime, he was up and ready to go for a walk by the time it was over! How do YOU cut your dog’s nails when they just don’t want it?